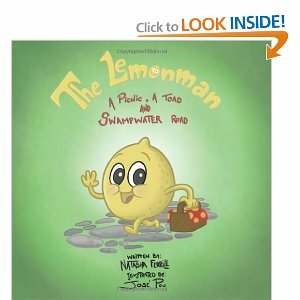 As you might have already guessed from the poetic title, “The Lemonman: A Picnic, a Toad and Swampwater Road”, is a children’s story told in rhyme. The author, Natasha Ferrill, did a good job of telling the story in verse. Most of the rhymes feel natural and roll right off the tongue, something that can be hard to find in a children’s rhyming story. Unlike many other attempts at verse which seem forced and awkward, Ferrill’s writing is a pleasure to read. The story itself is a creative story about animated fruits and vegetables who gained their human-like qualities through magic. The main character, the Lemonman, is a friendly fellow with a good heart who simply wants to spend a day with his friends having a picnic. However, on the way to the park, the Lemonman meets up with two troublemakers, one of which ends up swindling the Lemonman. As the story progresses, it becomes clear that the old saying “cheaters never prosper” could never be more true. But the real test comes in when the Lemonman finds himself in the position to get revenge. Should he get back at those who wronged him or should he show them kindness and forgiveness? When he decides to follow his heart, the Lemonman learns an important lesson and discovers the true meaning of friendship and compassion. No picture book review would be complete without a description of the illustrations, which for this book were done by an artist named Jose Pou. Although colorful and cheerful, the illustrations have a sort of old-world charm to them. Instead of the neon greens and yellows you might expect, the pictures are done in a pastel hue. Some of the artwork felt reminiscent of old-fashioned animation. In fact, the toad in the story reminds me a great deal of the classic Looney Tunes character, Michigan J. Frog. Overall, this book is a fun read that children are sure to enjoy. This is the first of an entire series of books about the Lemonman, so if your children enjoy the character, there should soon be more to share with them! It looks like the future is indeed looking sunny for our new yellow friend! To find out more about the book or to order a copy, you can visit the Lemonman website, although I should mention that the site is still under development. If this website is unavailable for some reason, you can also order the book from Amazon.